Need a good recipe for your party while you watch the game this weekend? These nachos are a quick and easy crowd-pleaser. Score! You don’t have to trek to your local sports bar to get a great plate of nachos. 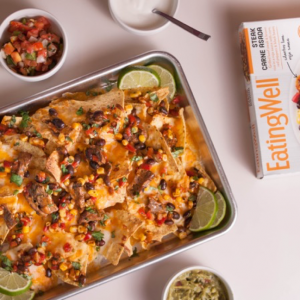 With a few basic ingredients, you can transform an EatingWell® entrée into a Sunday snack everyone will be clamoring to dip into. • Heat Steak Carne Asada frozen entrée according to package directions. • Preheat oven to 375 degrees. • Once entrée is cooked, combine steak & vegetables together (mix in rice if you prefer). • Line baking sheet with tortilla chips & top with cheese, onions & Steak Carne Asada mixture. • Bake for 8-10 minutes until cheese is melted. • Sprinkle chopped cilantro on top & serve with guacamole, pico de gallo & sour cream. Looking for more frozen food hacks? Follow us @EatingWellFrzn on Facebook, Instagram and Twitter to see more, or post your own yummy inventions and tag us @EatingWellFrzn!